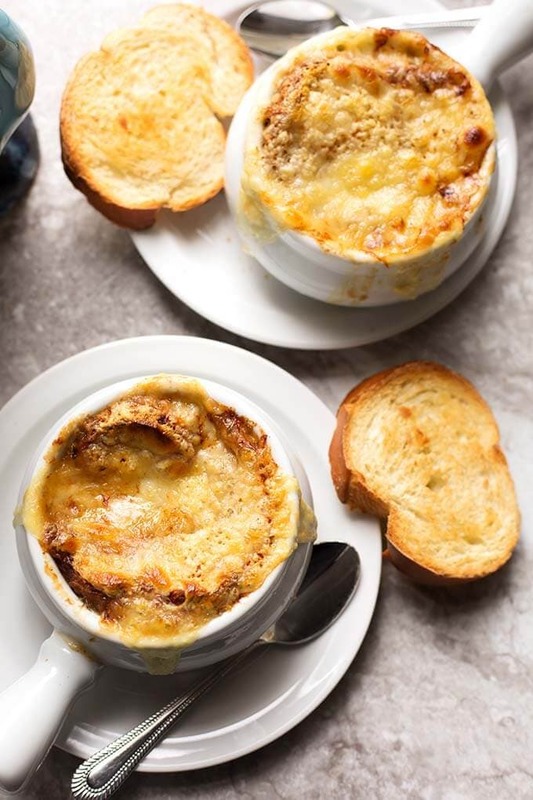 This Instant Pot French Onion Soup recipe is absolutely delicious! I take the time to really caramelize the onions, which makes them rich and sweet, with a lovely dark color. 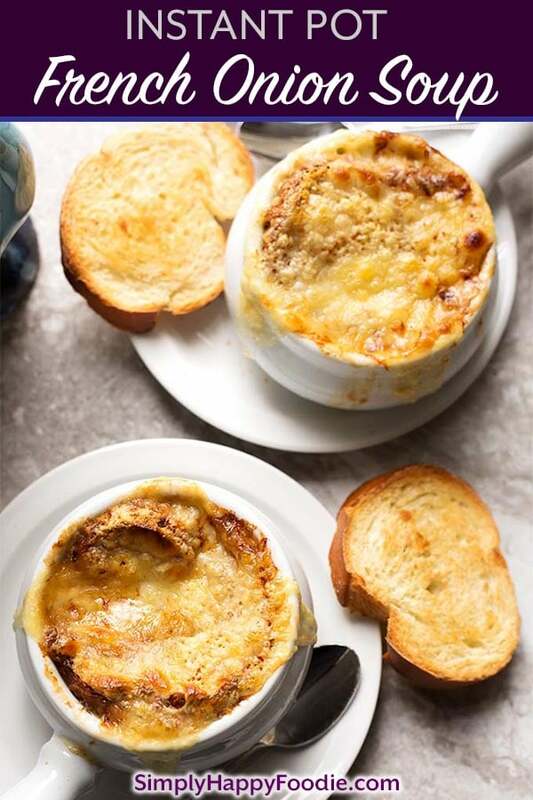 Pressure cooker French Onion Soup served gratinéed with bread and cheese on top is my favorite way to make this elegant one-pot meal. This is a recipe that I have made for years. It was inspired by the fabulous Julia Child, who I used to watch on TV when I was younger. She was so great at rolling with any little kitchen snafus that would happen. 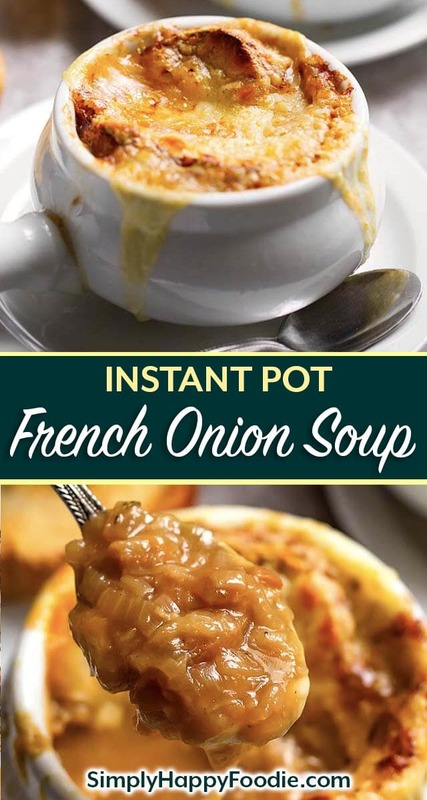 Last year I made it into an Instant Pot French Onion Soup recipe for my ebook of soups. I’m finally blogging about it! 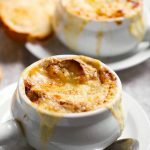 What can I tell you about Instant Pot French Onion Soup? Well, it is not a very fast cooking soup (I’m looking at you, caramelized onions! ), and it does take a little more effort and some babysitting. It’s really not that bad, except maybe slicing all those onions, lol! Trust me, it’s so worth it! This is a soup that you can serve to your fancy guests and have them all impressed with your mad cooking skills! 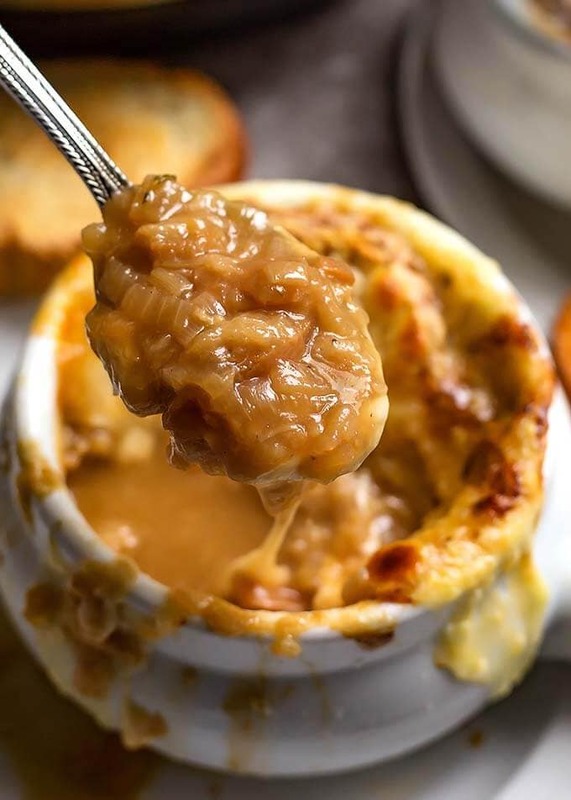 Tell them you made French Onion Soup in the Instant Pot and they will probably fall over! 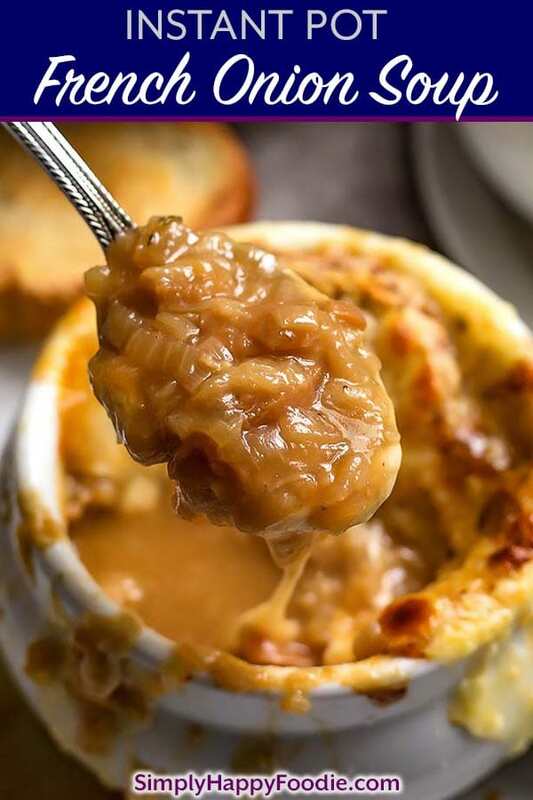 Instant Pot French Onion Soup is so delicious, with caramelized onions & rich beef broth. 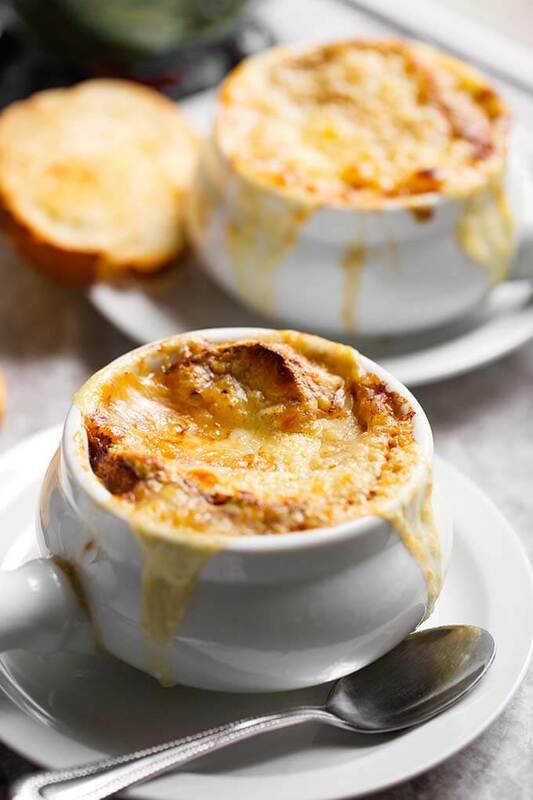 This pressure cooker French Onion Soup recipe is a favorite! 1 large Yellow Onion, peeled, cut in quarters and sliced thin to get small "quarter moon" shaped slices. 5 smaller Sweet Onions, peeled, cut in quarters and sliced thin to get small "quarter moon" shaped slices. Turn on the Sauté function and choose the Normal setting. When display reads “Hot” add the butter. Add the onions and baking soda. Stir to coat onions with the butter. Stir occasionally, while letting the onions cook for about 10 to 25 minutes. You might have to restart the Sauté function as it times out at 30 minutes on the IP. Keep checking back and stirring the mixture, scraping the bottom of the pot. As long as you check in on them and stir every few minutes, they should be fine, and not burn. Patience! Cook until the onions turn brown. It can take up to 25 minutes, but it is important. The caramelization is key to the flavor of this soup! When the onions are nicely brown and caramelized, add the thyme, garlic, and bay leaf. Stir. Then add the brandy and cook, uncovered, until it reduces, and the alcohol, and most of the liquid, has cooked off. Sprinkle flour over mixture and stir. Cook for a minute, stirring, to make sure the raw taste of the flour gets cooked out. Stir in the beef and chicken broths. Bring to a simmer, stirring occasionally. Make sure to scrape the bottom of the pot again. Press the Manual (or Pressure Cook) Button, or dial on Ultra. Set time to 5 minutes using the +/- buttons, or dial. High Pressure. When cook cycle ends, let the pot naturally release pressure for 10 minutes. Then manually release the remaining pressure by turning the knob to Venting (or push the button on the Ultra). When the pin in the lid drops. Open and stir the soup. Turn on the broiler to 450 degrees (F). Put rack about 2/3 from the bottom (second slot down on mine). Dish up the soup into oven safe bowls and place the bowls on a baking sheet. Place a slice of toasted French bread on top of each. Lay 1 slice of the Swiss cheese over each of the bread slices. Carefully put the baking sheet with the bowls of soup into the oven. If they are too heavy, put the baking sheet in first, and set the bowls on it. Broil until the cheese melts and browns to your liking. 1. Have everything sliced and measured, ready to go before you begin cooking. This will make the process much easier! 2. *The baking soda will speed up the browning of the onions. If you choose not to cook the onions long enough to caramelize them, the soup will still taste good, but it's so much better with caramelized onions! I was wondering how this soup can be called ‘KETO” when it has brandy in it? Who called it KETO? Where does it say that? Sandy, I love your recipes, and havent had anything ‘miss’ until this one. I’m trying to figure out how I messed it up, but it tasted washed out, like it was too watery still. Also thinking I may need to up the salt content. Do you think some extra reduction time on the stove can help improve it? Sorry to hear that, Jim. Not knowing what you did exactly, it’s hard to say what went wrong. Reducing it may help. Reduction, Worcestershire, and a few beef boulion cubes did it. I think maybe some Worcestershire off the bat might do it! My onions all turned to mush, seemed like too much butter. Lots of water from the onions. Never turned brown, just a dark gold. Went ahead and finished the soup. It had good flavor, but was just broth. What happened? That’s interesting, Eric. I don’t know what to tell you. Maybe cut the onions thicker next time? Was the sauté setting on “More” or “High”? What kind of onions did you use? This soup is really great! Maybe those who thought it was watery we’re impatient! Thank you, Marlene! I couldn’t figure out why they thought it was watery! I’m happy you liked it!